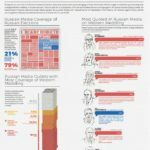 State actors, marketers, and fringe voices use the media – television, radio, print, and online – to achieve influence and shift perceptions. In many cases, this takes the form of disinformation that causes influence without facts, evidence, or logic. Drawing on subject matter expertise and intuition, an observer watching for the dissemination of such messages can sometimes spot examples to support their conclusions. However, identifying this kind of media strategy is incredibly challenging, labor-intensive, and prone to omission and confirmation bias. As analysts working to help our customers manage and mitigate media disinformation, we have found that automated tools provide a necessary edge in identifying media disinformation campaigns. What tools can government agencies and large corporations leverage to cut through the noise and provide true intelligence? Novetta Mission Analytics (NMA) provides a data-driven framework for identifying entity-centric patterns of behavior and uncovering actionable intelligence. 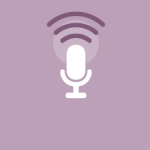 Using a unique, quote-based, human-in-the-loop data curation process, NMA deconstructs the information environment, maps adversarial actions, and measures hidden strategies. This process generates the most accurate, specific, and customized data for social and traditional media analysis. NMA empowers decision-makers to anticipate the media strategies of key influencers, amplify specific themes, craft counter-messages, and plan effective disruption campaigns that mute adversarial messaging. Figure 2. 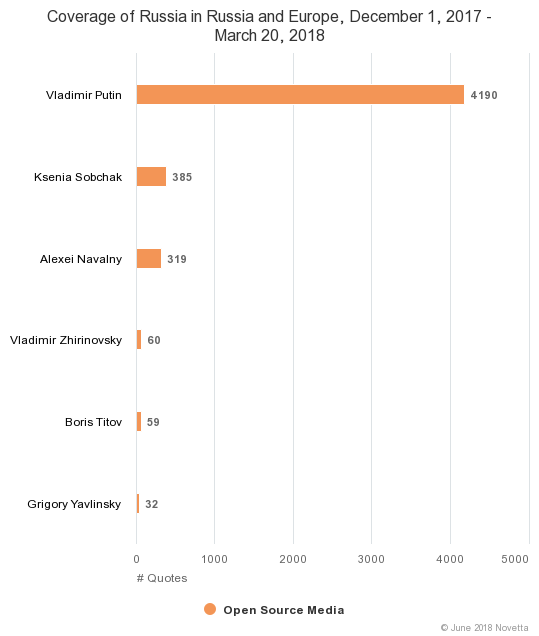 Visibility of President Vladimir Putin compared to all other candidates in the Russian elections, including opposition leader Alexei Navalny, who was excluded from the formal campaign and led protests in response. 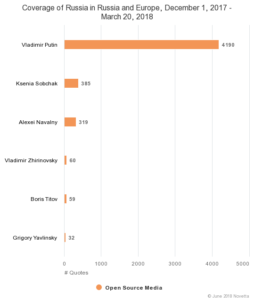 If the Russian elections themselves had been the primary focus of the thematic of “Russian elections,” we might expect to see more from other candidates, who were campaigning. Figure 1. 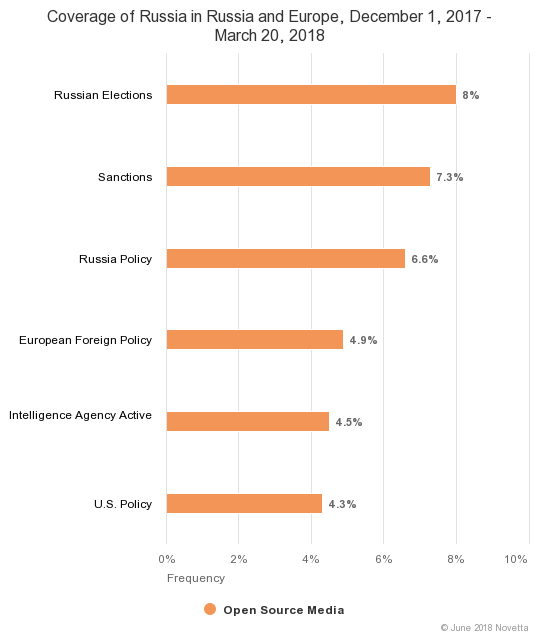 The Russian elections accounted for almost a tenth of Russia coverage in a 4-month period, overshadowing high-volume themes like Russia Policy, European Foreign Policy, and U.S. Policy, which reflect the day-to-day business of regional foreign policy. 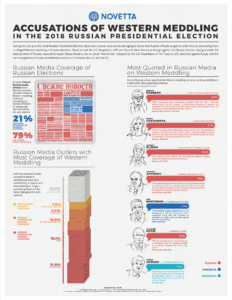 Coverage of Russian elections illustrates NMA’s ability to provide insights into disinformation campaigns. 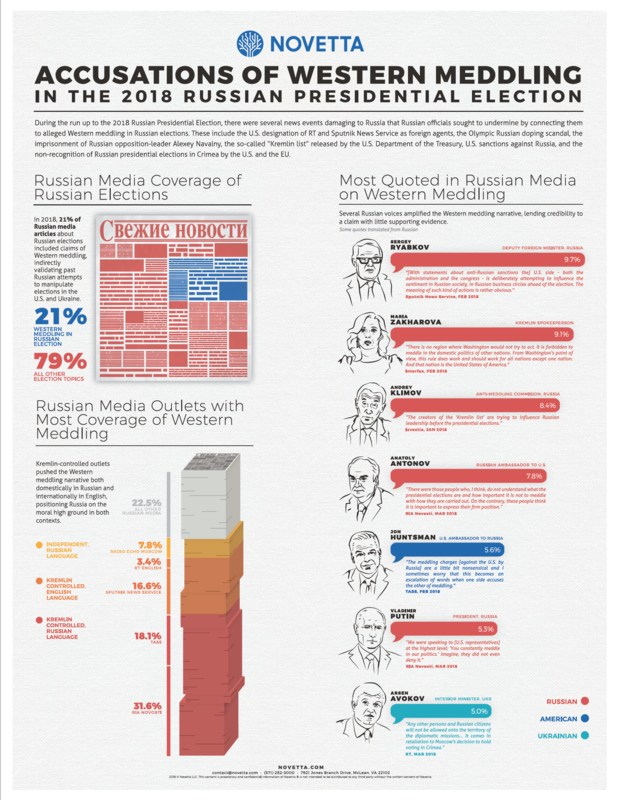 NMA revealed that from December 2017 to March 2018, Russian elections were a major theme in Russian messaging, resulting in disproportionate resonance in the European and Russian media environment. Our challenge is to understand why election coverage was so disproportionately prominent in Russia and Europe. Using NMA’s analytic framework, we determined that the major non-election stories above actually drove focus on the elections. Russian officials leveraged the attention from the aforementioned stories to accuse other countries of meddling in Russia’s domestic elections, even if countries were only reacting to Russian actions. 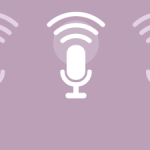 This pattern exemplifies the media strategy of high-volume noise and low-volume consistency in media environments. Major and controversial events raised noise and strong feelings in every direction, and through that noise Russian officials pushed the idea that the West, U.S. and its allies, were meddling. Though built on conspiracy theories and false-flag operations to an almost absurd degree, the consistency of Russian messaging was the important insight. 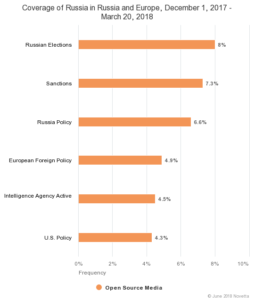 The West response as shown in the infographic (figure 3) did not resonate in comparison to the array of Russia’s messaging campaign. In addition to giving weight and credibility in the minds of the target audience to the external enemy, the narrative helped justify and provide moral equivalency to accusations in the Western press that Russia meddled in U.S. and European elections. The narrative that the U.S. meddles in Russian elections is not new, dating back to the 2011 presidential elections. However, NMA’s analytic framework provides a detailed characterization of how such known narratives are deployed and propagated by specific influencers, journalists, and media outlets. NMA also characterizes how narratives can be disrupted: our analysts produced an infographic (figure 3) detailing the shape and character of this disinformation effort. NMA’s analytics cut through the noisy modern information environment and revealed the origin, path, and resonance of friendly and adversarial messaging, giving decision-makers a strategic advantage in influence efforts. We empower the user to maximize the impact of their actions, whichever direction they go. 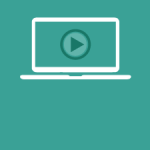 NMA’s analytic framework and human-in-the-loop data solution provide specific and actionable guidance, giving organizations a strategic and tactical advantage in today’s complex information environment.